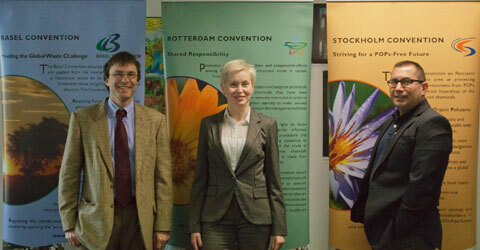 The Presidents of the conferences of the parties to the Basel, Rotterdam and Stockholm conventions met on 4 April 2013 to finalize arrangements for the preparation of the ordinary and extraordinary meetings of the conferences of the parties. The Presidents made some modifications to the tentative schedule of work for the meetings, in particular to the order of consideration of issues during the simultaneous sessions of the ordinary meetings of the conferences of the parties. The updated version of the tentative schedule is contained in document UNEP/FAO/CHW/RC/POPS/EXCOPS.2/INF/2/Rev.1. The Presidents also decided that they would rotate the chairing of the various sessions of the extraordinary meetings, as well as the simultaneous sessions of the ordinary meetings of the three conferences of the parties. Other topics considered included the arrangements for the high-level segment and the meetings of the bureaux during the ordinary and extraordinary meetings of the conferences of the parties.